Over 100 organizations will be in attendance to recruit UNO students and alumni for internship, part-time, full-time and graduate school opportunities; Feb. 27. 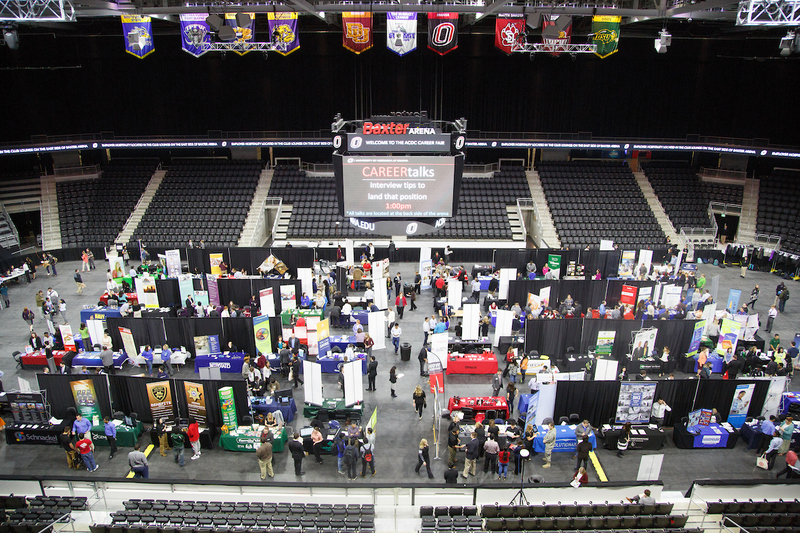 The Academic & Career Development Center is hosting the university-wide Spring Career & Internship Fair on Wednesday, Feb. 27, 2019 from 11 A.M. to 3 P.M. at Baxter Arena. All UNO students, alumni, faculty, staff are encouraged to attend. Over 130 organizations will be in attendance to recruit UNO students and alumni for internship, part-time, full-time and graduate school opportunities. A list of participating organizations and available opportunities can be found in Handshake. ACDC's goal is to use the fair as a catalyst to exploring different career opportunities in one setting. Helping students thrive through work and internship opportunities, the event allows students to develop new industry contacts while also allowing them to practice their networking skills. Additionally, attendees have the option to get a professional headshot taken during the event free of charge. Never been to a career fair on campus before? Don't worry, check out these tips on how to prepare for the big day and make the most of your time at the career fair.